Energen Corporation has a virtually unlevered balance sheet, a rare find in the oil patch. The stock prices of oil companies have been hammered over the past year. This drubbing is largely due to the dangerous combination of oil prices having been cut in half at a time when most oil companies had too much debt on their balance sheet. It's a nasty combination that has sent a growing portion of the industry to the brink of bankruptcy with some analysts worrying that a quarter of oil companies in America could go bust if oil prices don't improve. That worry, however, isn't one that Energen Corporation (NYSE:EGN) has as its balance sheet only has minimal debt. Given Energen's current outlook, the company expects to carry just $800 million in net debt this year, which is a relatively small amount for $4.5 billion oil company. Thanks to a disciplined capital program, the company hasn't overspent to drive growth over the past few years. As a result, it hasn't racked up a debt on the same scale of its peers. In fact, as we see on the following chart its overall net debt has fallen in recent years while the debt of shale drillers like Whiting Petroleum (NYSE:WLL) and Halcon Resources (NYSE:HK) have bolted higher. EGN Net Financial Debt (Quarterly) data by YCharts. As that chart shows, both Whiting and Halcon have in excess of $3 billion more debt than Energen, despite being relatively similar in size. This is largely due to the fact that Energen sold assets and equity in order to fund growth in excess of its cash flow instead of using debt to fund that growth. The net result is the fact that the company expects its net debt-to-EBITDAX ratio to be just 1.1 times this year, which is actually a slight reduction from last year's 1.2 times. This improvement is stemming from the fact that net debt is falling as well as the fact that the company hedges a lot of its oil and gas production, including 78% for the second half of this year. This conservative combination is why its net debt-to-EBITDA ratio hasn't surged like what we've seen happen at Whiting Petroleum this year, which only has 47% of its production hedged. 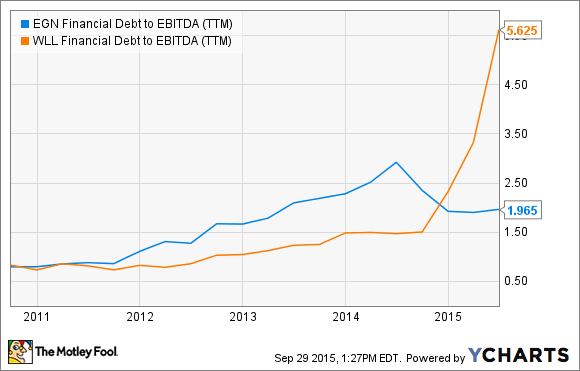 EGN Financial Debt to EBITDA (TTM) data by YCharts. Where Energen has been most conservative is in the fact that it has used asset sales to reduce its debt instead of using all of the cash proceeds from those sales to fund additional production growth. For example, late last year the company sold its legacy natural gas distribution business, Alagasco, for $1.6 billion while more recently it sold $384 million in natural gas properties in the San Juan Basin and in both cases those funds were largely used to reduce its debt. Data source: Company investor presentations and author's calculations. In other words, despite the lack of leverage to juice its growth, Energen still grew about as fast as its peers over the past few years, while taking on much less risk. 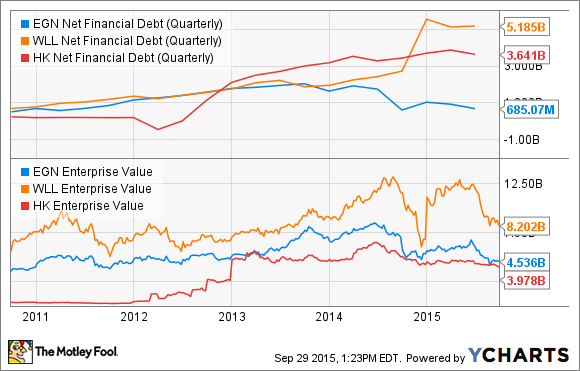 Energen has something its peers can only dream of: a balance sheet with very little debt. That's because, unlike Halcon Resources and Whiting Petroleum, it has avoided using debt to fund its growth and instead used asset sales to keep its debt at bay. That leaves it sitting in a nice spot as it doesn't have to worry about going bust should the oil market downturn rage on for a few more years.